This is a recipe my husband grew up with and its a really tasty dish to add to the dinner table. 500g (1.1 lbs) of raw prawns – peeled, deveined and sliced down the back to make a curl shape once cooked. 1 tsp tapioca flour if you need more add a little more if the sauce does not thicken. Heat the oil in a large frypan until hot. Add the prawns and stir in sea salt, garlic and shallots or parsley. Add the coconut aminos and broth and let it simmer with the tapioca flour to make a sauce to go with your garlic prawns. Stir until thickened and heated through. Serve hot in the sauce and add chilli if you like. 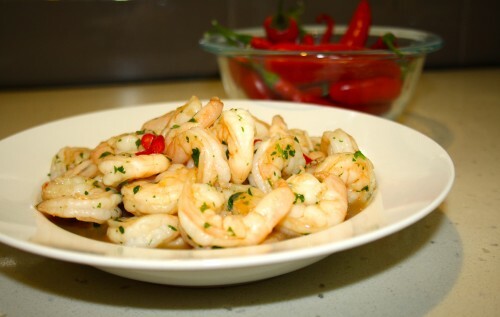 I love your recipe for prawns – it was a quick recipe that gave delicious results! My husband kept smiling while devouring the prawns and added his resounding vote of approval. One question: I’m not sure I know what “chilli” refers to: are they mild (jalapeno) or hot chillies and how much would you suggest? Even without them this was a fabulous dish. Thank you! Wow, Thanks Carol! I’m pleased that you and your husband enjoyed this dish. It is a different recipe then the normal Garlic Prawns and that is why I love it. I used fresh hot Chilli like the ones in the bowl behind the picture of the prawns. You could use how much you can take I guess, if it’s a mild chilli then use more. I added chilli as an optional item because I know some people either love chilli or can’t take the hotness of them. Feel free to post a picture next time on the Gusto Paleo Facebook page.